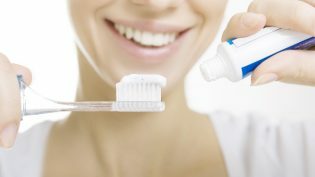 Just about everyone knows that brushing your teeth twice each day and flossing once each day are important when it comes to taking good care of our teeth and gums. But if you have ever walked down the dental aisle at your local drugstore, you know there are a lot of options for home dental care products. How do you know which ones to use? How do you know which might be best for your own teeth? When you are deciding on a toothbrush, one of the main differences you will encounter is in terms of size of the head and the softness of the bristles. The majority of dentists recommend a soft bristle brush to protect your gums and the roots of your teeth, so it’s generally best to stick to that. The toothbrush head size is usually considered a personal preference, so you can choose whichever size fits your mouth comfortably. There are numerous electric and electronic versions available today as well. Research does show that they are more effective at removing plaque than manual toothbrushes, so they are definitely worth considering. The most important thing about a toothbrush, however, is to remember to swap out your toothbrush with a new one once every three months (besides using it at least twice a day, of course). It’s generally a good idea to choose a toothpaste that first as the American Dental Association seal of acceptance on it. These are certified by the ADA to be safe and effective. As far as the rest of it goes, whatever toothpaste fits your personal preference in terms of texture and taste is fine. If it will encourage you to brush your teeth at least twice a day because you enjoy it, use it! There are a variety of flosses available including those that are waxed and unwaxed, flavored and unflavored, and it really boils down to personal preference. Dental picks with floss are also available and some people find these easier to use. It is important to remember that using floss is absolutely critical to keeping your gums and teeth healthy; don’t skip this important part of your oral hygiene routine! Of course, if you are unsure of what dental supplies you should be using, please don’t hesitate to give us a call at Classic Dental Smiles, your dental professionals in Rancho Bernardo!